^ "Capric acid," Chemical LAND21.com. Accessed 26 June 2008. ^ "Get your goat you've pulled...", Impressions Magazine, n.d. Accessed 26 June 2008. 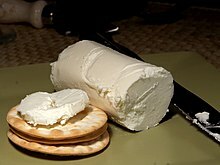 ^ "Gevrik Cheese," practicallyedible.com. Accessed 26 June 2008.